Rob has racked up over 17 years of Engineering & Production credits to his name, in many genres from House, Drum & Bass, Garage, Down Tempo, Electronic, Vocal, Acoustic, Hip Hop / Urban, Ambient & Chill Out and Reggae, as well as composing original music for TV and Multimedia (BBC World News, Channel 4 / CNN). In 2000, Rob co-wrote and produced ‘Casualty (Bound 4 Da Reload)’ at the Studios, which became a UK top 40 Number 1 selling over 250,000 records. 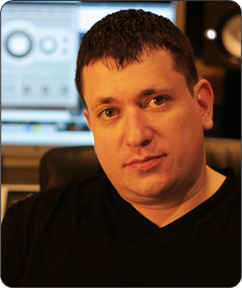 Rob is also a prolific producer & remixer and indeed an artist in his own right, with releases on an array of well recognized imprints worldwide. As a DJ, Rob has performed in many parts of the world including the United States, Spain, Eastern Europe (Prague, Bulgaria, Croatia, Slovakia and Germany) and all over the UK. Rob takes great pride in the service that the studios provide, not only has he developed a highly trained ear but he can also boast to having helped many a career of up and coming artists and groups over the years, leading to clients being signed to both major and independent labels and even on to chart success and beyond. Robert Owens, Rose Windross (Soul II Soul), Kym Marsh, Marc Almond, So Solid Crew, The Inhabitants, UK Apache, Tippa Irie, Jennie Mathius (Belle Stars), Hannah Liston, Oxide & Neutrino, Tasoulla, DJ Spen, Truesteppers, Asher D, Osaro, Nica Brooke, DJ Nehal (BBC Radio 1), Twisted individual, Vanity Fair, Aquasky. East West, Sony, 3MV, BMG, Mn2s, Plastic City, Evasive, Beechwood, Street Sounds, Warner, Reverberations, Dread Recordings, Ice Cream Records, Basement, Inspired, Wiggle, Swag Records, Twilight Crocodile, Red Handed, Conditional, Formation.